Safaei, Z., Azizi, M., Maryam, Y., Aroiee, H., Davarynejad, G. (2014). Effect of Different Irrigation Intervals and Anti-Transpirants Compounds on Yield and Yield Components of Black Cumin (Nigella Sativa). International Journal of Advanced Biological and Biomedical Research, 2(Issue 4 (2)), 326-335. Zeinab Safaei; Majid Azizi; Yarahmadi Maryam; Hossein Aroiee; Gholamhossein Davarynejad. "Effect of Different Irrigation Intervals and Anti-Transpirants Compounds on Yield and Yield Components of Black Cumin (Nigella Sativa)". 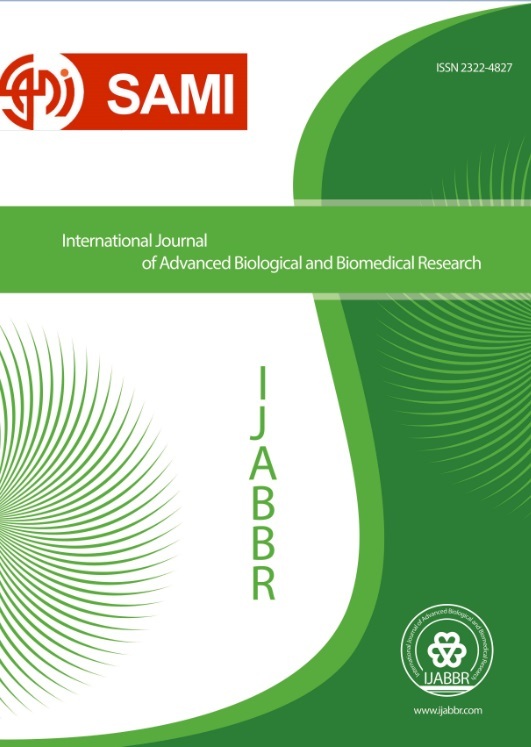 International Journal of Advanced Biological and Biomedical Research, 2, Issue 4 (2), 2014, 326-335. Safaei, Z., Azizi, M., Maryam, Y., Aroiee, H., Davarynejad, G. (2014). 'Effect of Different Irrigation Intervals and Anti-Transpirants Compounds on Yield and Yield Components of Black Cumin (Nigella Sativa)', International Journal of Advanced Biological and Biomedical Research, 2(Issue 4 (2)), pp. 326-335. Safaei, Z., Azizi, M., Maryam, Y., Aroiee, H., Davarynejad, G. Effect of Different Irrigation Intervals and Anti-Transpirants Compounds on Yield and Yield Components of Black Cumin (Nigella Sativa). International Journal of Advanced Biological and Biomedical Research, 2014; 2(Issue 4 (2)): 326-335. Water deficit stress, permanent or temporary, limits the growth and the distribution of natural vegetation and the performance of cultivated plants more than any other environmental factors. Mechanism involved is still not clear. In order to investigate the effect of different irrigation intervals and anti-transpirants compoundson yield and yield components of Black Cumin (Nigella sativa), an experiment was conducted at Research Station, Faculty of Agriculture, Ferdowsi University of Mashhad, in 2013. A split-plot layout based on randomized complete block design with three replications was used. Irrigation intervals (8, and 16 days) were allocated to main plots and anti-transpirants compounds chitosan (0, 0/25, 0/5, 1percent) and plantago mago rmucilage(0,0/5,1,1/5 percent) and gam arabic (0,0/25,0/5,0/75 percent) allocated to sub plots. Results showed that irrigation intervals had significant effects on all of the characteristics with the exception of 1000 seed weight. The 8 days irrigation interval produced more grain yield compared with 16 days irrigation intervals (621/56 vs. 484/23kg/ha). The greatest grain yield(760 kg/ha)and Lowest(419 kg/ha)Respectively at Treatment anti-transpirants compound chitosan1 percentWith8 days irrigation interval and gam arabic 0/25 percent was obtained with16 days irrigation interval. It seems that due to the lack of water in the area, anti-transpirants compound chitosan1 percentwith 8 days irrigation interval is the best combination for Black Cumin grain production in Mashhad.